Who doesn’t love a proper English brekkie on a Sunday afternoon? 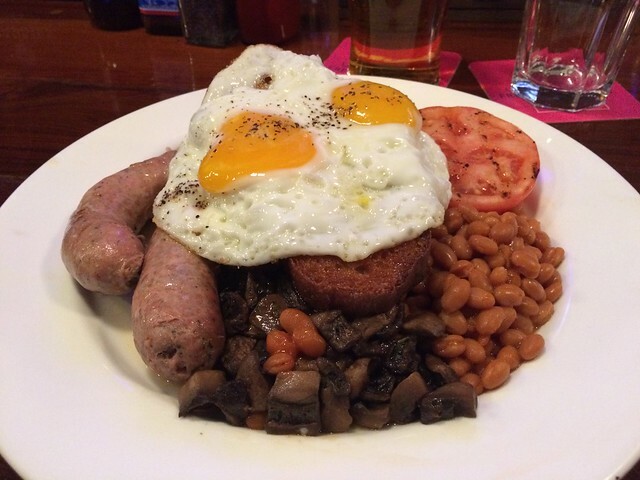 The Queen Vic’s version is certainly among the best full English breakfasts in DC. I have not done the proper eating research on this (in that I haven’t eaten all English Breakfasts in DC), but I’m confident it is so. Now that the English Premier League season wrapped up (and Chelsea won for the second time in three seasons), let’s celebrate the soccer off-season with a plate absolutely chock full of goodness. First slap a dollop of baked beans on the plate, and fill most of the remaining space with fried mushrooms as your base. Slip in a couple of bangers and sliced tomatoes along the edges. Then heap on well-fried pieces of bread and some bacon rashers. Finally, place two perfectly about to drip eggs sunny-side up as the pinnacle of your food pyramid. If you can eat it all, you win the honor and esteem of a well-earned nap. Don’t forget to acquire an Old Speckled Hen or a Boddingtons to wash it all down.